SAN FRANCISCO, Calif. /California Newswire/ — On Tuesday S.F. Mayor Lee and Board of Supervisors President David Chiu announced introduction of new Open Data legislation to strengthen San Francisco’s landmark Open Data initiatives, including the creation of a Chief Data Officer and encouraging the use of information for more efficient government services. The legislation is a major milestone in San Francisco’s Open Data initiative. 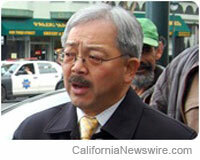 Mayor Lee also announced a new ground-breaking collaboration between City government and private industry partners. Motionloft, a real-world analytics company, will contribute a portion of their rich datasets to the City’s Open Data portal, DataSF. They are the first private business to partner with San Francisco in opening City-related data to the public. Mayor Lee also launched the new Recreation and Parks Department (RPD) mobile application as one of the many ways Open Data can be used to make government services more accessible to our City’s residents. The new application gives residents the ability to find new parks and playgrounds, submit feedback, and future updates will include mobile ticketing, permits and more. RPD partnered with San Francisco-based Appallicious, a mobile commerce company, to develop the Rec and Park app at no cost. In 2009, Mayor Gavin Newsom issued an Open Data Executive Directive requiring City departments to make all non-confidential datasets under their authority available on DataSF.org, the City’s one stop web site for government data. The new Open Data legislation once again demonstrates what it means for San Francisco to be on the cutting edge of government openness and transparency by making data sets publicly available and making City services easier to access for our residents. Mayor Lee and Board President Chiu will introduce the Open Data legislation at the Board of Supervisors’ October 16th meeting.